Khatoo Kothari is overjoyed. Last year he got his children admitted to a private school. His village, Ogna, is deep inside the Udaipur reserve forest in Rajasthan where hardly anyone goes to school. His neighbour Seetaram Kothari is also in high spirits, though for a different reason. A skilled bamboo cutter, he would spend most of the year working as a casual labourer in cities to repay moneylenders. For two years now, he has been earning far more without leaving his village. He plans to write off his family debt by June. With the help of the National Bamboo Mission, Hyderabad, and using unspent funds from Rajasthan Forestry and Biodiversity Project, an employment generation programme funded by the Japanese government, Sharma organised a training course on making incense sticks for the residents of Ogna and other forest villages in Jhadol block. But he soon realised that his efforts were not yielding the desired result. Making incense sticks involves a painstaking method of cutting bamboo and splitting it into thin sticks using a knife. Using this traditional method, a group of four or five people can produce barely five kilogrammes of incense sticks after a day’s hard work. “This rate of production was far too less to earn them a good living,” says Sharma. A chance meeting with Pareshbhai Panchal, an innovator and entrepreneur from Ahmedabad, helped him carry his mission forward. Panchal was visiting Udaipur to procure raw material for his incense factory. 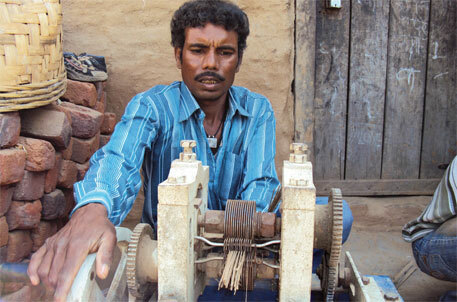 Panchal suggested using the kind of electrical machine used in his factory. The machine helped produce incense sticks on an industrial scale and did not require much manpower. This defeated Sharma’s purpose of creating jobs for the forest dwellers in their own village. Sharma discussed the problem with Panchal who subsequently developed a manually operated machine suitable for cottage industries. He supplied 120 such machines to the residents of Ogna, who have since been producing 30-60 kg of incense sticks every day. Panchal, who has patented the machine and received the Seventh National Biennial Grassroots Innovation Award on March 7, procures a major portion of their produce. In the past year, he has procured 8 tonnes of incence sticks from the Ogna tribals for about Rs 4 lakh. Training the tribals on making bamboo furniture was the next ambitious project of Sharma. With financial help from the Maitreya Group of Companies under its corporate social responsibility initiative, his department organised a two-month training course in making bamboo furniture in Jhadol. The training has helped Reena Pariya, a woman in her 20s, earn Rs 4,000 a month and respect in her scavenger community. Last month a company ordered furniture from the group, and the 35-member self-help group is busy working to meet the deadline. Meanwhile, Sharma has organised training courses for the forest dwellers in making aloevera juice and squash of custard apple, jamun and several other fruits. But his only worry is the forest department may not be able to facilitate them for long. “We are now training them how to market the products,” says Sharma, who in March received the National Innovation Partnership Award from the President. My appreciation to Sri OPSarma, we need several people like him. These are the ones who understand the miseries of people and work sincerely for peoples prosperity.Certainly he will be able to do many more such projects.